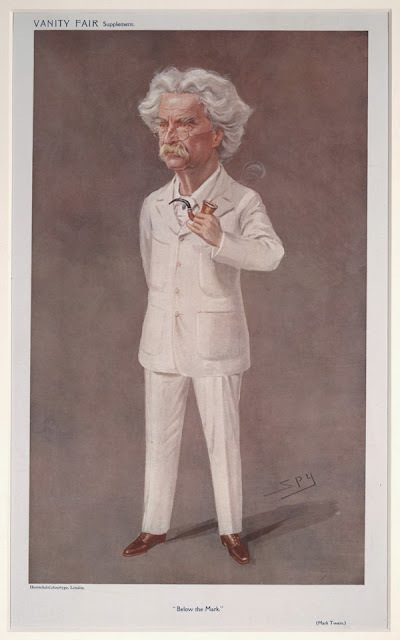 BOOKTRYST: Mark Twain a Bore? 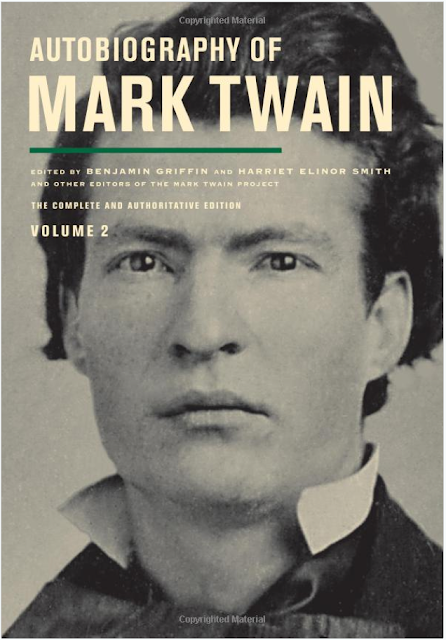 If, like me, the steps to your bookshelf are paved with good intentions, you probably have Mark Twain's fat Autobiography volume 1 shoulder to shoulder with other "to read" titles. I delved into it, read whole chunks, but didn't start at page one and set forth, so now volume 2 is here, and time and tide waiting for no man, I jump, like Twain, in medias res. Twain's autobiography, which he wrote by dictation, was just a rambling one-sided conversation full of random reminiscences, no holds barred, but often sweet or poignant, and not intended for publication until a century after his death. That century having elapsed in 2010 we now get one of his great works, in his own voice (The concluding third volume should be along any year now). After a lifetime as a famous raconteur polishing his delivery and perfecting his linguistic games, it's a glorious gift. He says it's like no other autobiography -- apart from perhaps Cellini's. There was a twinkle in his eye as he said that, I am sure. (Cellini however really did murder his rivals, Twain just told them, "I had in fancy taken his life several times every year, and always in new and increasingly cruel and inhuman ways, but that now I was pacified, appeased, happy, even jubilant; and that thenceforth I should hold him my true and valued friend and never kill him again.") You can open it anywhere and read any part and since short attention spans are the order of the day this kind of sporty reading is perfect. If you are in any doubt that this is the greatest kind of American humor then sample ‪his "I've ALWAYS been into college girls" ‬routine (April 4, 1906), which is a hoot and certainly adumbrates the wit of Groucho Marx, Sid Perelman and others who followed Twain. He claims that his blushes at being asked to speak to a group of college girls were manufactured, for he is a master at appearing coy. "It makes me the most winning old thing that ever went among confiding girls. I held a reception on that stage for an hour or two, and all Vassar, ancient and modern shook hands with me. Some of the moderns were too beautiful for words and I was very friendly with those. I was so hoping somebody would want to kiss me for my mother, but I didn't dare to suggest it for myself. Presently, however, when it happened, I did what I could to make it contagious, and succeeded. This required art, but I had it in stock." You may think of manufactured celebrity as a phenomenon of our era. Even if, like me, you cannot tell Justin Timberlake from Justin Bieber, you cannot avoid Paris Hilton or those rich Armenian women, what are they called, the Sarkastians? The Karkrashians? I try to ignore them (also), but since I do watch television and blindly follow Facebook links I am surprised how often their names turn up on the actual news, even though they are not known for being good at anything. Such celebrity bogosities are not merely of our time. 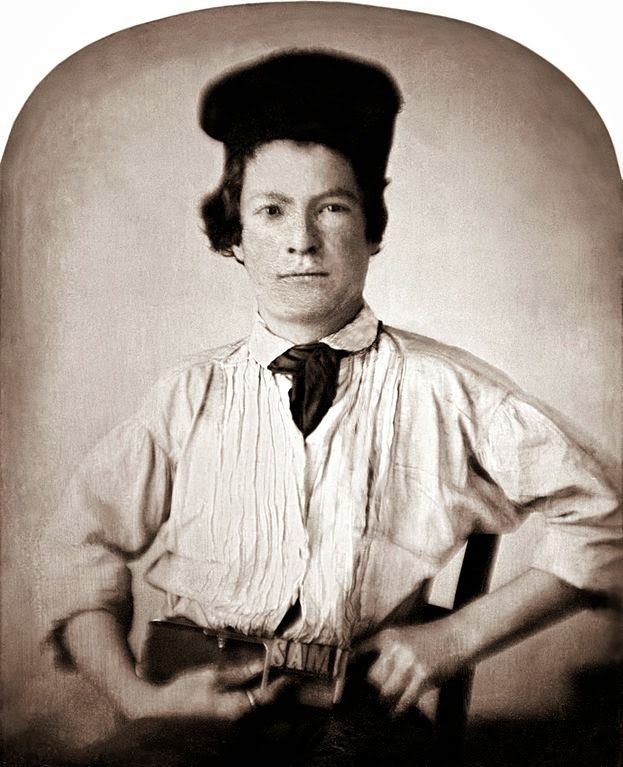 Twain talks about Olive Logan. She married a penny-a-line copywriter and got him to put notices in the paper, "Olive Logan has taken a summer place at Cohasset," "Olive Logan thinks Transcendentalism is passing away," etc, until people in small towns began to wonder who she was. She then went on a lecture tour and made $100 a night for showing up and mouthing rubbish, but everyone went to see her. "I didn't think the day would ever come when my heart would soften towards Olive Logan," writes Twain, "and I would put my hands before my eyes if she were drowning, so as not to see it." The New Yorker recently ran a good piece by Ben Tarnoff that pointed out Twain's currency: "Ironic narcissism is more or less our national default mode now, but Twain was ahead of his time." But Tarnoff cites reviews of volume one that condemned Twain as a boring old fart. Those pointing the finger were Adam Gopnik and Garrison Keillor. Really? Come on! Garrison Keillor, that smarmy git, called volume one "a ragbag of scraps." I am glad of Keillor's distinctive voice because it alerts me in time to turn off the radio before I have to listen to his pretentious twaddle. (People never paid him any mind when he was just Gary Keillor.) Talk about a "ragbag of scraps," his donkey dung may be sugar-coated but it is donkey dung nonetheless! I propose we drain Lake Woebegone, and, as Emperor Claudius said, "Let all the poisons that lurk in the mud hatch out!" "Gopnik" (a cross between a beatnik and a gobstopper or a tiny version of one of Gellett Burgess's Goops), wrote this piece dismissing Twain's first volume as a shaggy dog story without a punchline. Has he never read Tristram Shandy? That's an epic shaggy dog story without a punchline (unless the "site" of Uncle Toby's wound is considered a payoff) and something Gopnik might aspire to emulate if he doesn't want to end up lost in the footnotes to People Once Thought Smart Who Wrote in the New Yorker. The ages old juxtaposition of expert opinion versus the popular taste goes back to Pilgrim's Progress, the first example of a book where popular acclaim overrode the expert minority, according to Macauley. We don't need these critics to tell us why we shouldn't read Twain. Sure, he's rambling, that's the charm of it. You should be so lucky to have time to dictate your memoirs from your deathbed for two years! Twain has given us so much, a lot of it not in the novels, but in conversations, letters, asides and these here dictations. Many years ago I wrote to the Mark Twain archive at UC Berkeley and asked if they could verify that Twain had coined the expression "Jesus H. Christ." They were generous with their time, and sent me a chunk of information from his autobiographical dictation which I used in my book on nineteenth-century typefounders' specimens (Alphabets to Order, British Library, 2000). The relevant parts in full occupy three pages of volume one, and concern Clemens' fellow apprentice printer on the Hannibal Courier, Wales McCormick. These three pages comprise a brilliant short story (with a brief digression on eating potatoes with Kaiser Wilhelm II). Roughly the tale is this: Sam and Wales are apprenticed to Mr Ament, publisher of the Hannibal Courier, who gives them board and clothes, but no pay. The clothes were the master's cast-offs: "I was only about half as big as Ament, consequently his shirts gave me the uncomfortable sense of living in a circus-tent, and I had to turn up his pants to my ears to make them short enough." Wales had the opposite problem, being a large lad, and was suffocated by the hand-me-downs. Mrs Ament played her part in the "Amentian idea" for she sweetened the apprentices' coffee herself with a deft trick. She dipped the teaspoon in the coffee first to make it wet then into the sugar bowl, but she turned the spoon over so what looked like a heaping spoon of sugar was in reality the bottom of the teaspoon with a thin layer of sugar on it which she then put into the lads' brew and stirred. The preacher Alexander Campbell came to town and gave a rousing sermon. The Campbellites so loved his words they subscribed $16 to have his sermon printed. The apprentices set up the work and made a proof but hit a snag. McCormick had left out two words in a thinly spaced line and there was not a break for another three pages which meant he would have to reset a hundred or more lines of solid matter, and furthermore, it was Saturday morning, coming up on their only afternoon off. Wales had the idea to abbreviate Jesus Christ to "J.C." "It made room for the missing words, but it took 99 percent of the solemnity out of a particularly solemn sentence. We sent off the revise and waited. We were not intending to wait long. In the circumstances we meant to get out and go fishing before that revise should get back, but we were not speedy enough." Sure enough Campbell appears and reads them a lecture on diminishing the savior's name. Wales decided since he would miss his afternoon's fishing he would at least have some sport, so enlarged the offending J.C. into Jesus H. Christ. "Wales knew that would make prodigious trouble, and it did. But it was not in him to resist it. He had to succumb to the law of his make. I don't remember what his punishment was, but he was not the person to care for that. He had already collected his dividend." Like good ancient tomes these autobiographical volumes have chapter heads with synopses of the upcoming section so you can coast through to the bits you may want to read about General Grant, Ellen Terry, Petroleum V. Nasby or others of his contemporaries. But they are only fleeting personae: "This autobiography of mine is a mirror, and I am looking at myself in it all the time. Incidentally I notice the people that pass along at my back -- I get glimpses of them in the mirror -- and whenever they say or do anything that can help advertise me and flatter me and raise me in my own estimation, I set these things down in my autobiography." How's that for honesty? His sly, self-deprecatory wit shines out of every page. There's a rich secret conspiratorial correspondence with a Brooklyn librarian over the banning of Tom Sawyer and Huck Finn from the children's section of the public library that shows what a caring person he was. He immediately takes the librarian into his bosom and writes him long confidential letters, because he has found an ally. Some critics lament that so much attention is showered on one writer when there are other deserving writers who are neglected, but Twain is an archetype of a great writer and deserves our attention until he has had his say. Thank god! Finally, someone who loves the old man as much as I do and recognizes that the purpose of this autobiography was never to tell us about Mark's life but, rather, to resurrect him 100 years after his death. And, truly, if you can read either volume and not at some point feel that he is in the room speaking to you, at you, around you and through you then you're more dead than he is.